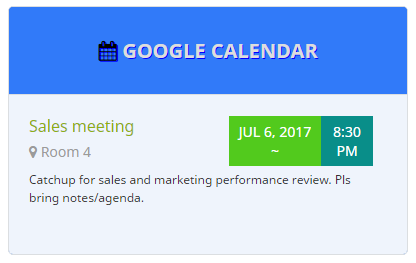 We have just introduced new classes for the Google Calendar widget date & time components. These allow you to customize the date and time with CSS and achieve any styling you want. You can match your website style and make your Calendar Event date/time more prominent in the feed. This article focuses on the CSS used for the date/time components of your custom Google Calendar widget. You can find out more about how to use CSS to style the remaining widget components in our in-depth article on Google Calendar CSS. This class is for the clock icon which appears alongside the date/time by default. The ‘Time’ class styles the time element of the date/time. The ‘Date’ class styles the date element of the date/time. This class styles both date and time components. Useful for adding a border around the whole date+time element, or to reposition the whole date+time element using margins. Using these CSS classes you can create a widget such as the example below. You can find the full CSS used for this custom Gcal widget here. If you need any assistance with customizing your Google Calendar widget, please contact us and we’ll be happy to help!